I must confess, there’s something about walking along an exotic tropical pool-garden path that sends me to an instant state of calm. 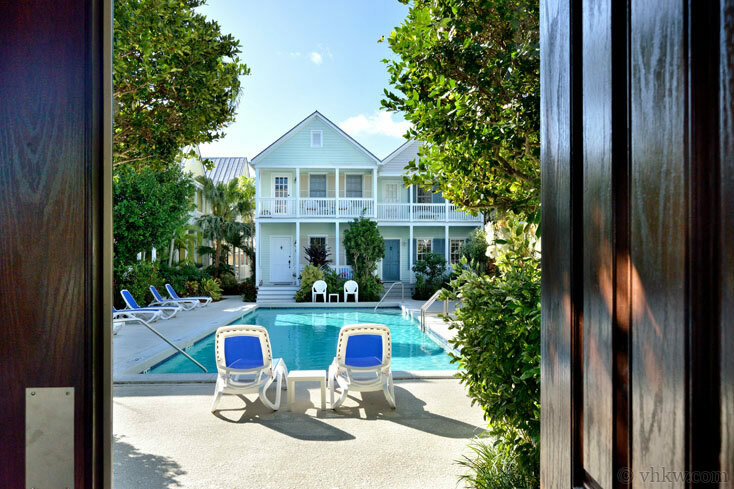 Palm fronds gently dancing in the breeze, orchids hanging in the trees, manicured gardens, a pristine swimming pool set with comfortable lounge chairs. 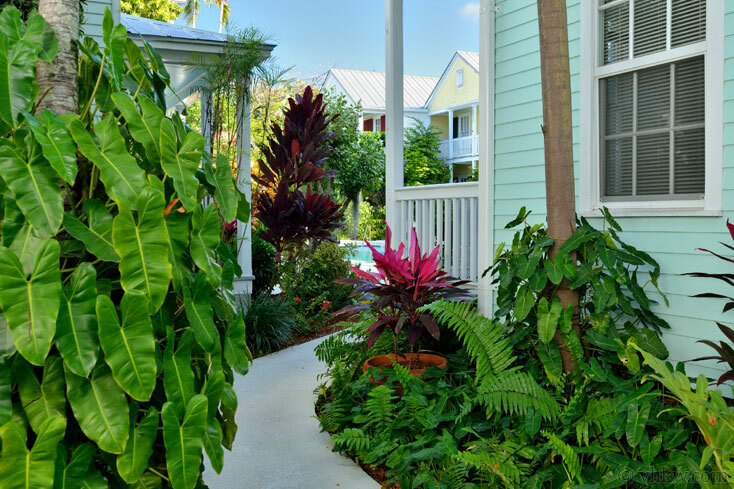 This is what you’ll experience as you make your entrance to this beautiful Bahamian ‘eyebrow’ style home, nestled away in private back corner of the small Old Town Key West gated community of Windward Park. This completely renovated home has the architectural allure of a vintage design, with all the advantages of a modern interior layout and luxury amenities. The front door prepares you for the touch of class you’ll find inside, with the vintage style glass etched transom window above the window pane front door. The entrance leads directly into the spacious open-concept great-room, with the living room on one side and the kitchen on the other. Multiple sets of traditional sash windows on the living room side invite in the sunlight and assure a view of the garden from several angles. The great-room encompasses almost the entire 1st floor, with a white marble double-level counter top and breakfast bar subtly diving the spaces. The U-shaped galley kitchen commands a complete view of the living room, the perfect layout for cooking and entertaining or watching the 48” HD TV on the opposite end of the living room. 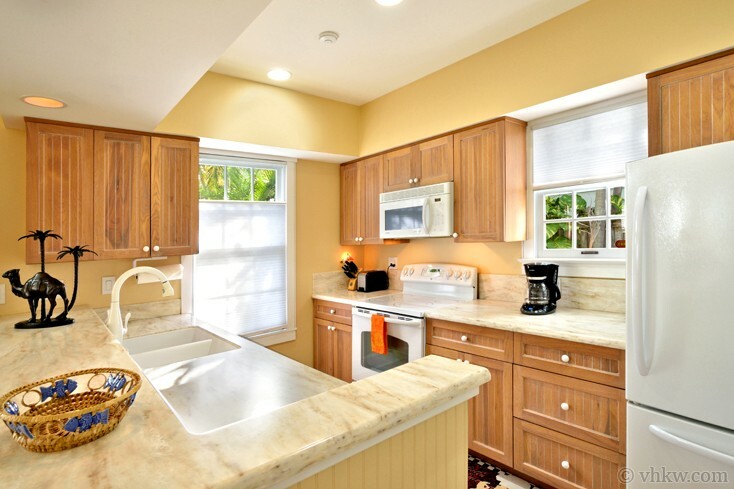 The kitchen is nicely equipped with particular cooks in mind, providing high-end appliances and nice serve ware. Beautiful white-washed bead-board cabinets give the kitchen a fashionable coastal style, which fits so naturally in the tropics. In a complete renovation of this home, the owner/designers chose light wood plank flooring laid vertically, adding to the spacious feel of the room. An island monotone color scheme of sand, cream, white, and bamboo create a sophisticated and relaxing feel. Top quality wood and bamboo furnishings are placed to compliment the room. The end result is a beautiful room that invites you to slow down, kick back and relax. For your convenience, a matching desk is placed to hold a laptop where you can comfortably catch up on email, but hopefully not work too much! To complete the 1st floor, a hidden laundry closet and full bathroom, are set over to one corner near the kitchen. 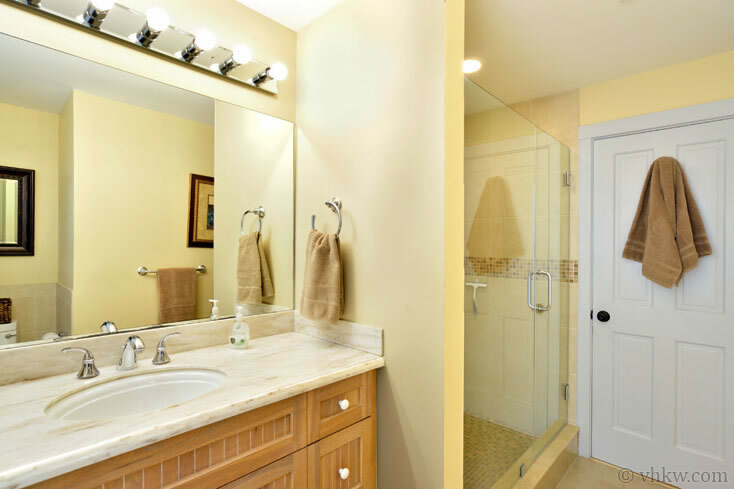 The same beautiful coastal style cabinets and marble counter top we see in the kitchen are carried to the bathroom. 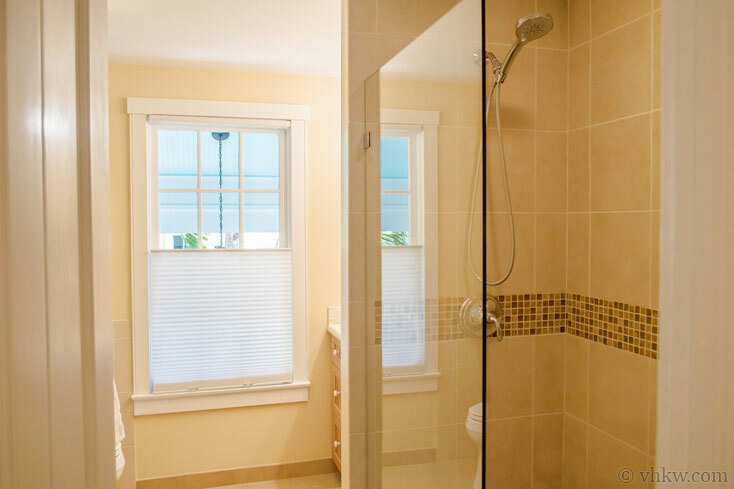 This is a full bathroom with tiled shower and a custom frameless glass door. A traditional stair case in a far corner of the living room, leads to the 2nd floor. Since both bedrooms and the second full bathroom are upstairs, there’s plenty of separation between the common rooms and the sleeping area. 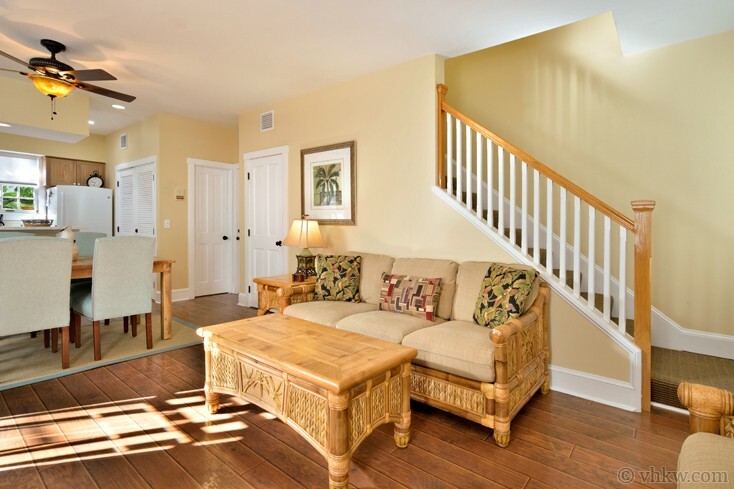 Both bedrooms are stylishly decorated, keeping with the soft sand tone island colors established downstairs. Each bedroom provides a comfortable king size bed, with beautiful headboard, and dressed with very nice quality linens. A high end sisal wall-to-wall carpet is placed in both bedrooms. Two sash windows in each bedroom let in plenty of light, and provide a down-look view of the gardens below. Both bedrooms provides a TV. You’ll appreciate the privacy provided by the split floor plan upstairs, with the bedrooms on either side of the house and the bathroom in between. 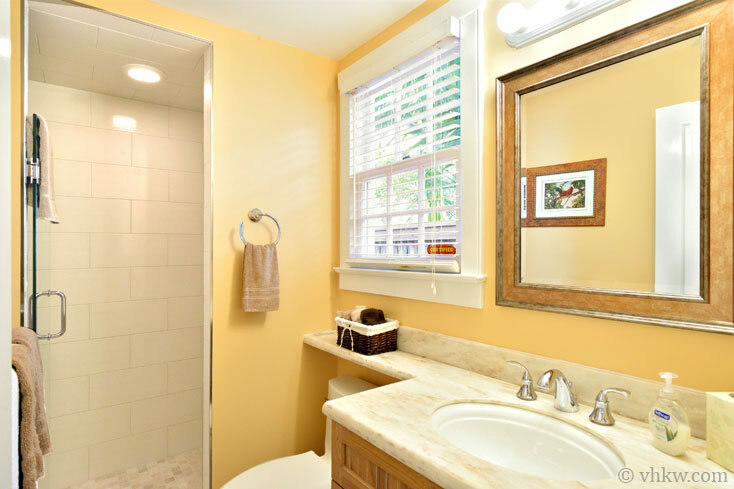 The larger upstairs bathroom is fit with the same beautiful marble top vanity we find downstairs, plus a two-person shower with frameless glass shower doors. Designer fixtures and tumbled marble tiles carry through the luxurious tone. It should be emphasized that this home is special and unique to this small gated compound. It is the only free-standing home amongst 12 townhomes in the community, and tucked away back in the corner for maximum privacy. Unlike the other properties, it does not share an interior wall with any other home. 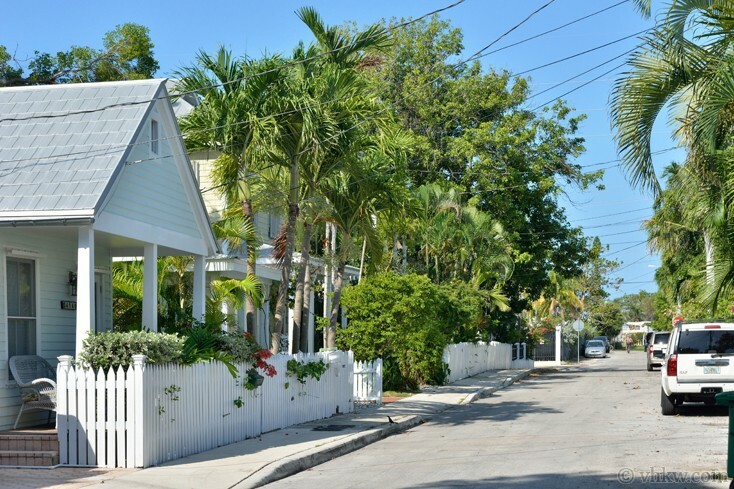 It also has one designated off-street parking space, a coveted commodity on the tiny island of Key West. Finally, it is worth noting that the owners of this beautiful home enjoy it themselves, when they can take time from their own busy schedule. 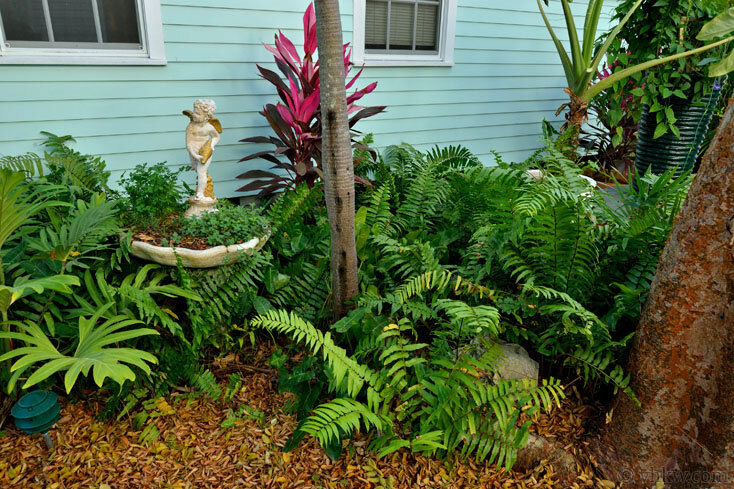 They are sticklers for maintaining the property in top shape and strive to assure its immaculate condition. Bedroom 1 - 1 king bed. Amenities: Lush manicured tropical garden, shared large heated swimming pool, private sun deck, fully fenced, fully equipped kitchen. Central A/C, washer / dryer, 48” Flat Screen TV in living room. TV in each bedroom. Linens and towels are provided. Activities: Walk everywhere in Old Town from this location. Shopping, restaurants, night life, museums, sailing, boating, snorkeling, diving, beach, theatre, family activities. Parking: This home has private designated off-street parking for one car. However, with this central location you really never need to get in your car. Enjoy walking or biking everywhere - you'll see more that way. Restrictions: 7 night minimum, even in off-season. Smoke free house. No pets (please don't ask). The property is located in a private residential townhouse complex and is definitely not suitable for staging loud parties. Maximum of 4 guests allowed. We do not accept guests less than 25 years of age unless accompanied by a family group or guardian. We loved Dancing Palms. It was very nice and clean...and we’re very picky. It’s just a couple blocks off Duval, so it wasn’t a problem to walk to all the restaurants , shops and entertainment whenever we wanted. 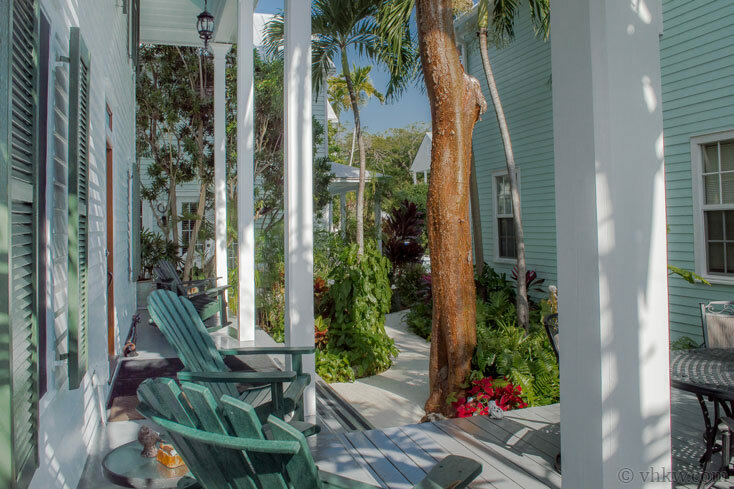 Our favorite feature of the house was the secluded private deck surrounded by the beautiful exotic landscaping and the rocking chairs on the front porch. All this, was still just steeps from the immaculately clean swimming pool. VHKW was a very personable and easy company to work with. We highly recommend them and Dancing Palms. You won’t be disappointed. The process is always fast and friendly. The homes are also always immaculate! This was our 4th year and we will continue!!!! We head to Key West every year from CA. This year was one of our best trips. The home was better than expected and we intend to stay there again next year. Clean with everything you would need for a week in KW. Nice pool and grounds and off street parking is a plus. Can't say enough good things about this place. VHKW is first class, excellent communication and provided superior service. The house was so nice and close to a lot of great places. We definitely want to stay here again! 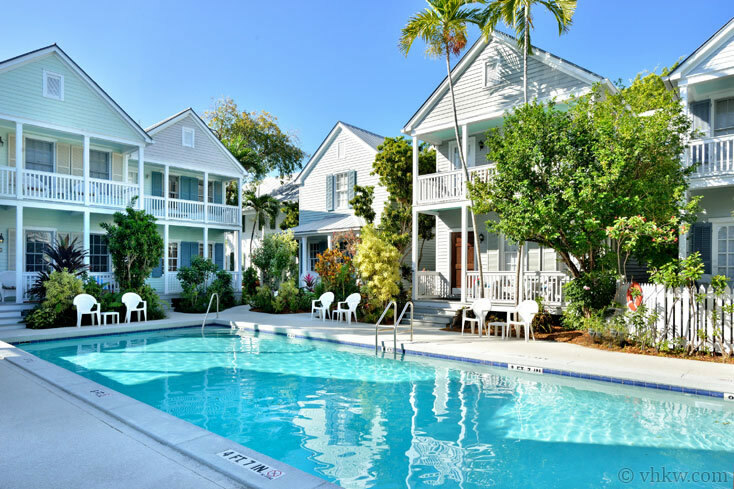 I have rented from you for the past 3 years in Key West and have had great service every time! This property was as advertised. Very clean , comfortable, and convenient. nice pool, and patio. Very pleasant neighbors. This property has a superb location, within walking distance of almost everything. the free Duval Loop bus stop is right around the corner. 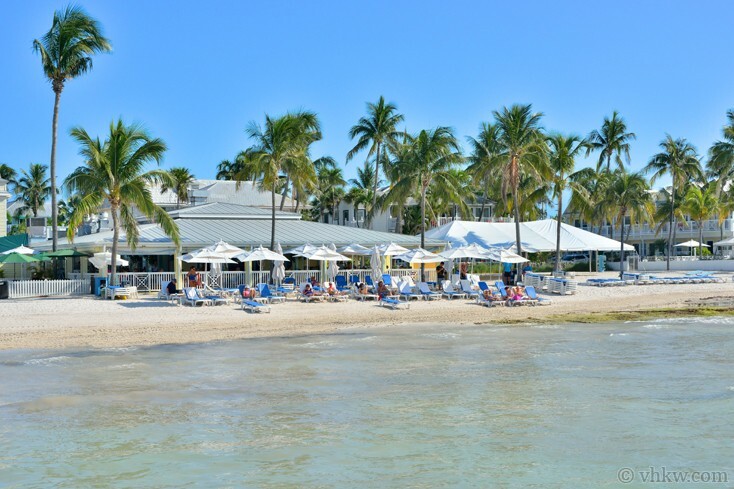 WE had a great stay at Dancing Palms. The Dancing Palm villa was perfect. The location, parking and quiet getaway was ideal. Booking with you was easy and your staff very pleasant. Rental access was painless with the lockbox at location, love that!! Rental was extremely clean and comfortable and enjoyable! Location is perfect. Will book this rental again. Only suggestion, rental needs pool towels and more bath wash cloth as they only have 4. We'll be back! Great location!!! Beautiful home!!! Would love to stay again! We had an awesome time. We were very fortunate in being able to check in early, and the house had everything we needed. The community was a nice break from the schedule of fantasy fest. Great Vacation. Wonderful to work with and a great location. Clean as a whistle and fantastic pool. Loved the kitchen! Beds were great. Phenomenal house in an awesome community. Very quiet and secure with a great pool. Will definitely stay there again. Perfect location! We had such a great experience. The home was lovely. All the amenities of home ❤️ Neighbors & complex were very safe and friendly. 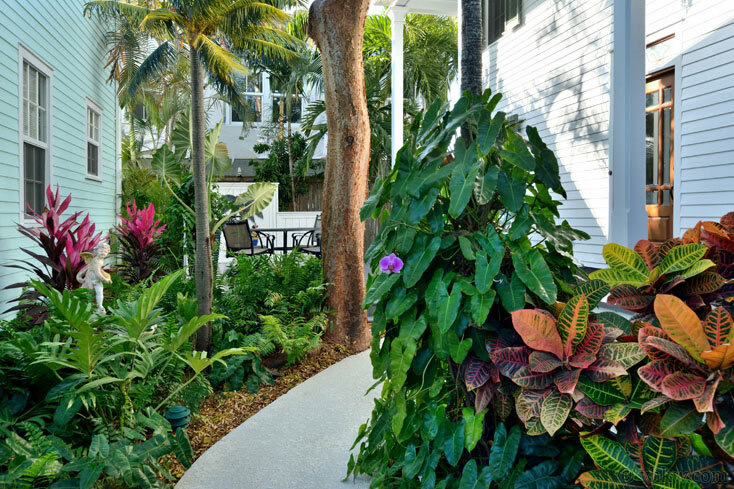 Number 9 was accurately portrayed online & we couldn't have stayed at a better place-relaxing yet vibrant, immaculate landscaping. We will try to visit again next year. 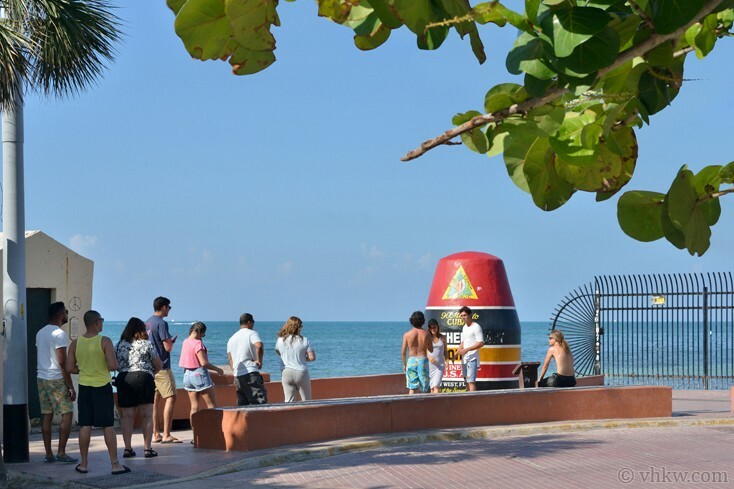 The history of Key West & the people we a fabulous family experience. The house was beautiful. We have stayed in this compound before. 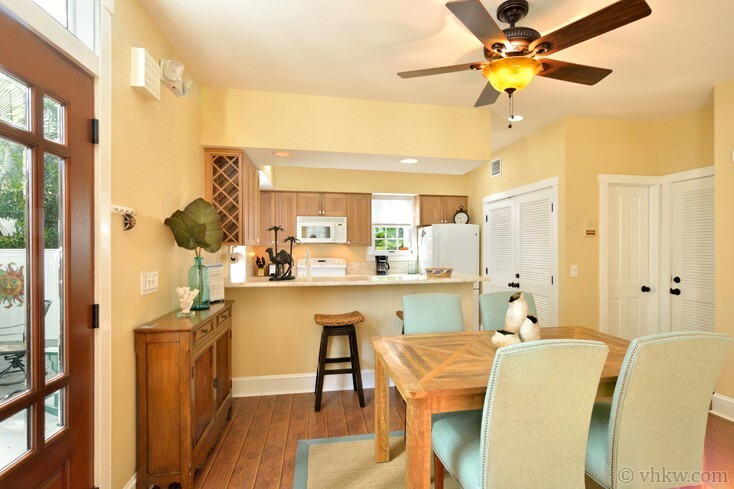 We love the convenience of the location but it is so tropical that you don't realize your right in the heart of town. Can't wait to visit again. My favorite place on earth. 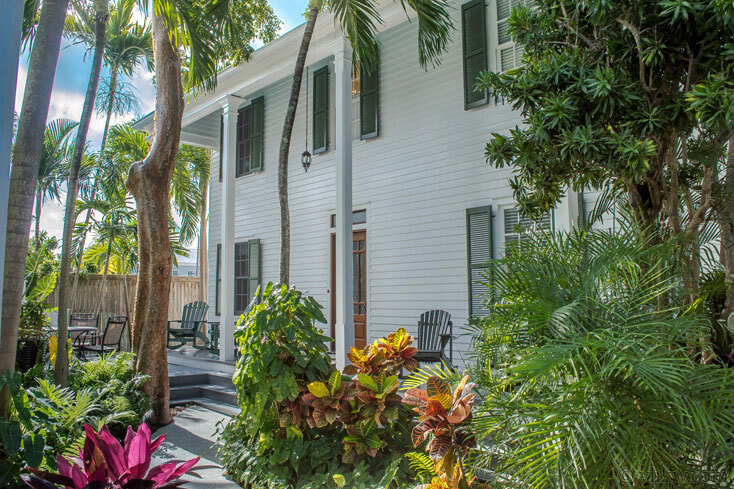 Great property with easy access to everything in Key West.